On the surface, this is a review of a classic documentary about a massive, illegal 1965 strike by Canadian postal workers – written by a postal worker, who was himself involved in the rotating strikes at Canada Post last year. But deeper than that, it’s a reflection on how militancy is kept alive in a union. The answer, the author says, is not by electing or trusting a particular union leadership, because they always tend to act as a conservative force. Instead, militancy has to be built up and kept alive by rank-and-filers themselves, through their own activity. 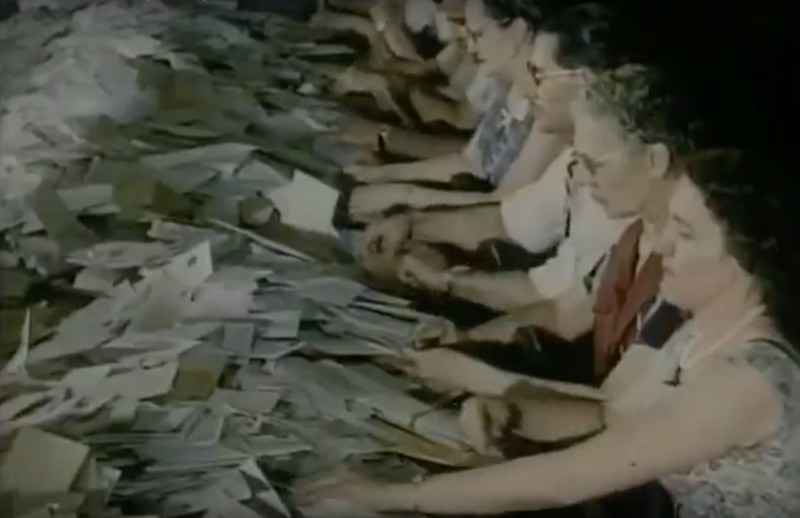 Memory and Muscle is a documentary about the 1965 postal worker strike that was published by the Canadian Union of Postal Workers (CUPW) in 1995, on the 30th anniversary of the strike. It consists of a series of interviews with postal workers who were involved in that strike, and provides historical context as well as the reasons why striking was seen as the only solution – despite it being generally unheard of in the public sector at this time. It also documents the failure of past postal worker associations and the rise of CUPW through the work of a militant work floor that defied its leadership. The first time I watched Memory and Muscle, I was in training to be a shop steward. I could feel my blood pressure rising as I booed and hissed at the behaviour of management and the government toward the postal workers. The thought of how people have used the position of shop steward as a way to get into management blew my mind: how could anyone do that after what we’ve been through? While I maintain that position, I realize, after going through a job action, that I missed the broader point of the documentary. The point is not that management is bad – I mean, of course it is – but that we need to learn how to deal with our own union leadership and empower the rank-and-file members if we are to achieve our demands. I learned this firsthand: from October 22nd until November 27 th, 2018, I was engaged in a series of rotating strikes against the Canada Post Corporation (CPC) as a member of CUPW. Things seemed to be going in our favour. The ratio of honks to middle fingers directed at our picket lines was uplifting. Things had changed since the last job action in 2011 when rotating strikes quickly led to a lockout by CPC. This was followed by back-to-work legislation. But that legislation had since been deemed unconstitutional. We had a new Prime Minister who said he respected the collective bargaining process. He was even photographed with a sign clearly indicating his love for postal workers (“I <3 Posties!”). But perhaps we misread the rebus: once again, CUPW was legislated back to work. Further job actions were to be met with daily fines: $1,000 for rank-and-file members, $50,000 for union representatives, and $100,000 for CUPW itself. In the lead-up to this legislation being passed, CUPW leadership kept acting as though it had a plan. Up until the last minute, those of us involved with organizing the strikes and the picket lines were eagerly looking at our phones and awaiting the message that this time we would defy the legislation. Those of us with union positions were told to resign from them so that the fines wouldn’t be as severe if we did defy, so we kept thinking it would be a possibility. The picket line dwindled as the deadline inched closer. People began crossing the line with their vehicles in order to secure a parking spot. Others even tried to enter the depot before the strike was over. To the credit of management, however, they did keep the doors locked until the legislation was official. We kept waiting and checking, but the word never came from the union. CUPW, with its history of militant action, folded under the pressure. Management unlocked the doors. We put our tails between our legs and went back to work with slightly more disappointment and disbelief than usual. Some people thanked those of us who had been involved with organizing. Others knew all along, of course, that it was pointless to try anything – though only one person approached us to say as much. During our early stages of organizing the floor, this same person made it clear to us that it failed before and it would fail again. (When I was trying to build a phone tree, he told me not to bother taking down his information because he was just going to be a scab.) He made me angry, but hindsight tells me it was mostly because he was right. He wasn’t right in criticizing us for thinking that we could better our conditions through collective action. But it seems we were wrong for believing our union leadership had a plan and that they would be willing to do what was necessary to achieve our demands. This push, it seems, was something that had to come from us – the workers on the floors and in the streets. A lesson we once learned and have since forgotten, but is still conveniently contained in a documentary. Let’s take a look at how Memory and Muscle gets this point across. According to the film, there were four things that contributed to the deterioration of conditions in the post office and led to the postal worker strike of 1965. First, non-unionized, part-time employees were hired. These employees were paid less than full-time employees and they were mostly women; and because they were mostly women, the existing associations viewed them as taking “men’s jobs” and so did not support them. These women were sexually abused and harassed by management and many were afraid to complain because they could be fired without question or recourse. Because they were so cheap, however, more and more of them were being hired. Second, the postal clerk and letter carrier associations that came before CUPW were not useful or helpful. The Federal Association of Letter Carriers had formed in 1891 and the Canadian Postal Employees Association in 1911, but despite this long history there were no collective agreements and workers couldn’t file grievances. These associations could make requests of the employer, but they would typically back down once the employer said the request would cost too much. According to the postal workers interviewed in Memory and Muscle, these associations did not have strong member support, and relatively few postal workers actually attended their meetings, as those meetings were more likely to be about the colour of uniform ties than anything useful to the workers. This allowed a relatively small group of people to take control, and they didn’t want to rock the boat because the associations were viewed as more of a social club and stepping-stone to a management position. Third, management implemented a new plan that tried to squeeze more work out of the same number of employees: this saw letter carriers working 12-hour days and sorters having to sort 25 letters per minute or face reprimand. This led to a number of incidents of exhaustion, fainting, and even heart attacks. To deal with this, workers went around their associations and formed a committee that went to the national office in Ottawa to address these conditions. Showing the power of issuing a demand over making a request, they let the government know they would not be returning to work in the same conditions. The Deputy Minister responded that the system could be changed from coast-to-coast in 48-hours. The committee responded by saying the Deputy Minister had 24-hours. The fourth issue contributing to the strike was the low rate of pay postal workers received. According to one postal worker, letter carriers realized there was a problem when the welfare cheques they were delivering were worth more than what postal workers were making ($4,380 per year, which is approximately $34,143 CAD today). With a newfound respect for militancy and the knowledge of how useless their existing associations were, postal clerks and letter carriers formed the ad hoc Postal Workers Brotherhood and demanded an annual wage increase of $660. The government responded with a raise of between $300 and $360, despite having just given its own Members of Parliament a raise of $8,000. The negotiation process was denounced as a sham by Willie Houle, one of the main organizers out of Montreal, because it became clear that was never really any negotiating taking place. The association leadership said the workers were asking for too much and, aside from that, you couldn’t strike the government. The National Executive also claimed the workers wouldn’t support a strike. The newly-formed Brotherhood itself claimed a strike would be irresponsible. The problem was that postal workers remembered the strike of 1924 when they were crushed. Supervisors and the Postmaster had been scabs and their continued presence in management roles in the post office were a reminder of that earlier defeat. But workers did just experience a successful victory in demanding their working conditions be improved. Association leadership was still useless, but the rank and file’s militancy at least had accomplished something. To deal with the striking postal workers, the government appointed Justice J.C. Anderson. Anderson decided that the postal workers would receive a raise of $360 with the potential for more upon further review. When asked if they were willing to go back, postal workers said that they were not interested in a review and that the strike would continue. The government took a hard line with Anderson’s decision. The Brotherhood also agreed that the workers should return to work. In Montreal, the postal workers refused, stating that they were still on strike for $660 – even after being threatened with being fired. Rumours began to spread after a telegram was received in Toronto that claimed the rank-and-file leadership in Montreal had agreed to go back to work. Re-watching Memory and Muscle hurt. The conditions in the post office today are painfully similar to those of 1965. The 2011 legislation contained reduced wages for employees hired after 2013. Health and safety was a major part of the strike of 2018, as CPC acknowledged there was an injury crisis in the post office and the statistics revealed that postal workers have the highest rate of injury of all federal employees – five times higher than dockworkers, who claim the second highest rate of injury. CUPW pointed out in negotiations that the rate of injury is tied to what CPC dubbed “modern post,” the method of delivery that was pushed through after 2011. This contained a number of changes, but the sticking point is letter carriers now having to juggle three bundles of mail instead of just one. Routes were also made longer because now some of the mail is sorted by machine. In negotiations, CPC claimed it would cost too much to switch back. Even though the corporation claims to care deeply about our health and safety (their slogan “Make it Safe, Make it Home” can be found all over the workplaces), it seems some cost-benefit analysis was done. This analysis must have concluded that the injury rate was worth not giving us safe work. We already knew negotiations were a sham, though, so this was no surprise. The real lesson from Memory and Muscle, which I shamefully missed during the first time I watched it, was how we are to deal with our own leadership. The film really drives this point home as it shows that workers defied their own leadership three times by ignoring the warnings from the association for clerks, the association for letter carriers, and even the Brotherhood. As we stood outside on a cold Tuesday morning for what would be our last picket shift for a rotating strike that had gone on longer – and I would say more successfully – than we thought it would, we were certain our national union leadership would tell us we would be defying legislation. We had momentum and, whether they truly supported the actions or not, members tended to follow directions from the national office. After being legislated back to work a handful of times since the 1980s, and with the recent Supreme Court victory declaring the last legislation unconstitutional, it was inconceivable that our leadership hadn’t planned for this outcome all along. A bulletin was released shortly before the legislation came into effect. It stated that by Christmas there would be at least 315 disabling injuries to postal workers; 250,000 hours worked without pay for Rural and Suburban Mail Carriers (RSMCs); thousands of hours of forced overtime for urban postal workers; and the continuation of RSMCs being treated with “equity but not equality.” While the bulletin was partially right for blaming the back-to-work legislation for allowing this to continue, choosing the known and not defying the legislation also puts the responsibility on CUPW. The rumour eventually spread that National would be willing to defy if the members took the first step and refused to return to work. While I wish that was what happened, it was disappointing to hear: this is a top-down organization and nothing we did in the lead-up was done to empower the rank-and-file to make this call. What happened was, in the end, the logical conclusion of this type of unionism: disconnected bureaucrats who view the workers as game pieces to move around. The workers weren’t engaged. We were waiting to be told what to do. There was a plan, don’t worry. We were waiting for our elected union leaders to save us. For better or worse, we would have respected the authority of the national office if we had been told to defy. Workers were tired and wanted the ordeal to be over, and they would have grumbled, but with a clear plan and better communication, the outcome would have been different. Our leaders rested on their laurels. They inherited a militant union but because they were either unwilling or unable, they have chosen time and time again to not be a living example of that tradition. Somewhere along the way, we forgot this important lesson from Memory and Muscle: our official leadership is not going to help us. If we want not only the next round of negotiations but also our work floor to be different, and if we want to live up to CUPW’s militant history, we are going to have to organize differently. Negotiations are currently out of CUPW’s hands as arbitration has begun. In three months or so, we’ll know what the damage is. Or maybe the results will be fine enough and we’ll hear that it’s not as bad as it could have been. Will the new negotiation tactic be to aim for ‘good enough’ from arbitration? Where will we be then? Since the back-to-work legislation came into effect, the refrain from the national office has been that the fight is not over and that all options are still on the table. But if the word comes down, will postal workers listen? Why should we listen to orders from an executive that continues to let us down? It has become clear that they think the rules and the law are going to protect us and show that we were right, but years will have passed by then. We’ll have ratified a contract and conditions will have further deteriorated and it will be too late. I feel like we have been duped enough. I don’t think this was done maliciously. I believe these people comprising the national leadership are doing their best and doing what they think is right. But I also believe they have become too far removed and that they have lost sight of how CUPW achieved its goals in the past, how it became a bastion of militancy in the Canadian labour movement, as shown in Memory and Muscle and in the successful strikes that followed (such as the strike of 1981, which won improved maternity leave benefits and set the standard for workers all over Canada). On the plus side, the broader community has been showing support for postal workers consistently since the legislation. Concerned citizens as well as members of the labour movement have been shutting down letter carrier depots and processing plants. Members of the Industrial Workers of the World have been prominent in this movement, as their flags can be seen consistently in photos of these community cross pickets. In Hamilton, these cross pickets seem to pop up weekly. In Edmonton, community pickets have even sprung up at the airport to cut off access to Canada Post’s loading docks. Similar community militancy has occurred in Vancouver, Windsor, Toronto, Montreal, Quebec, and Sydney. Unfortunately, it seems some CUPW members don’t know how to handle the support. We’ve had 5-ton drivers threaten picketers and inch their vehicles dangerously close and call the police; and even a member of CPC’s Security and Investigation team directed a driver to drive into picketers – though the driver refused. It’s clear that we have a lot of rebuilding, reorganizing, and education to do on the ground, especially if our members can’t handle a community picket. We seem to have lost the spirit of 1965. But it still exists. It is being tended to by the community. I just hope we can find our way back to it.